Join the discussion on our forums! 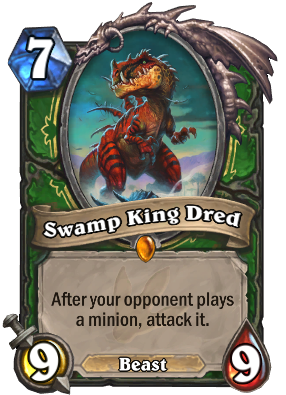 Come discuss Swamp King Dred over in our dedicated Swamp King Dred discussion topic. I got him from a pack yesterday. I put him in my big beast hunter deck. This was my first Un'goro-Legendary. When you put this card in your deck, the MATCHMAKER WILL PUNISH YOU. I'm FORCED TO LEAVE IT OUT. For anyone wondering - this minion will attack cards such as Aldor Peacekeeper and Eadric the PureAFTER their battlecry triggers, meaning that a 1-attack Dred will be attacking. Why does this guy not get played more often? He has fantastic stats for his cost and can be devastating to your opponents combos. His only weakness is poisonous minions but they are rare, that are almost all low cost and will likely have been played then, if the opponent has any at all. If I had the dust I would absolutely craft this guy. I've got him a couple of time from Jeweled Macaw and both times he single-handedly won me the game, the first time against another hunter and the second time being against a rogue, who in that game instantly conceded, presumably because he couldn't combo his Gadgetzan Auctioneer. Getting Dred off of a Macaw is unpredictable, so the opponent can't plan for it or play around it without some disruption to their game, and you haven't used a card slot in your deck for a 7-cost control card, so it makes sense that he's won you the match both times. Taking that slot up loses you what might be a vital midrange or face card that you'll likely need in the majority of your other matchups. I love this card, but right now he's extremely difficult to play given the meta flooding with aggro druid, pirate warrior, quest rogue, and burn mage. He's not multifaceted enough to demand a spot in any of the meta decks, though any player good enough (not me, not yet!) can make most cards work if they're talented enough. Guys like Kibler, Firebat, and Toast all prove that. I'm hoping the next expansion slows down the meta enough to legitimize a true midrange hunter that includes Dred instead of this face hunter garbage with 2-4 +5-cost cards claiming to be midrange. Most hunter decks secure victory by turn 3 outside of massive board clears or amazing RNG plays. Until then, the King is dead, long live the King. This card DESTROYS zoo! Love it! If this attacks before a battlecry this would see way more play. My first gold legendary was this beaut. And he gets a hard removal to the face EVERY FOOKIN TIME! I just got it! I wanna make a deck with it!